I thoroughly enjoy being the new guy on the team. There are zero expectations that you know anything and there is every expectation that you soon will. There are people to meet, things to learn, and opportunities to grow. I love all of that. I love being the one asking the questions, the one creating new relationships, and the one giving others reason to rethink things. I haven’t always felt that way, but I most certainly have come to appreciate the opportunity that accompanies being the new guy. The nomadic life of a Sailor certainly gives us plenty of opportunity to grow comfortable in that role. During this most recent transition, I was able to share more time with my son than during any other move. And I must admit that watching him navigate this move has reminded me that not everyone feels the same. There is challenge that accompanies letting go of the familiar and there is fear in embracing the unknown. And all fear dissipates when the new chooses to embrace you. I have grown accustomed to being embraced upon arrival. It’s the Navy culture. We welcome our newest teammates and we do our best to make them feel comfortable in their new home. Because I had grown to expect a warm reception, I looked forward to being the new guy. My son had not benefitted from the experiences I have and questioned how he would be received. Such discomfort caused him great stress and left him questioning his ability to make new friends after bidding farewell to those who meant so much to him at our most recent home. This stress grew as he combed the new neighborhood looking for kids to befriend without much success. This very stress dissipated when neighborhood kids presented themselves and confidence built when his new swim team and coach welcomed him. The Navy tells us that the tone for a tour of duty is set within the first 72 hours of arrival to our new team. We can debate the length of time after arrival that dictates the overarching experience, but that’s not the point. The point is that our experience within a team is largely dictated by those who are already established within the team or neighborhood we are joining. We can arrive with high expectations and great confidence only to be disappointed by people who couldn’t care less about our presence. At the same time, we can arrive full of skepticism and questioning our ability to fit in only to be made to feel extremely important by those welcoming us. We may be responsible for the energy we bring into a room, but the reception by those in the room affect us more than we care to admit. My son and I remain extremely new to our respective teams, but we are now already among those who welcome teammates even newer than we are. We will continue to ask questions, make new friends, and integrate within the team. Yet we will also set the tone for others and affect the reputation of the team to which we now belong. Our teams will be stronger or weaker than they were prior to arrival, for it is impossible for them to remain constant given the variables we each represent. Our effect is on us. 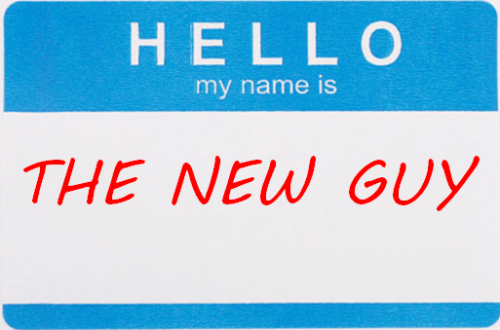 When was the last time you were “The New Guy”? How do you make new teammates feel? Are you making your team better? Spot on Sean. Felt like I was reading a narrative of my current situation. I was just the New Guy at USNA for a Candidate Visit Weekend. I was barely on the Yard for 36 hours, but I felt like I belonged. I miss it already. My plebe host welcomed me like a brother. He invited in half a dozen company mids and they all shared with me how to succeed. Having now experienced the brotherhood first hand, I can’t wait to be a new kind of New Guy next June. Life’s a journey, let’s begin.